At the Convergence EMEA 2015 conference, Microsoft introduced its latest service called Microsoft PowerApps. The service is currently in limited preview which will allow selected enterprise customers the opportunity to use the service prior to a general availability release. Omar Khan, partner director of program management at Microsoft, describes, during a recent webinar, a common scenario for most IT departments is “IT struggles to keep up with business demand. Based upon engagements with customers, Microsoft expects this trend to continue in coming years." Khan also highlighted other challenges for IT departments including skill shortages and many mobile applications still relying upon VPN connections when accessing enterprise back-end data sources. As a result of these challenges, Microsoft has developed PowerApps which targets organizations looking for increased productivity. Microsoft positions this service’s ability to improve productivity, by requiring a low-barrier of entry when developing business applications, as a key enabler. 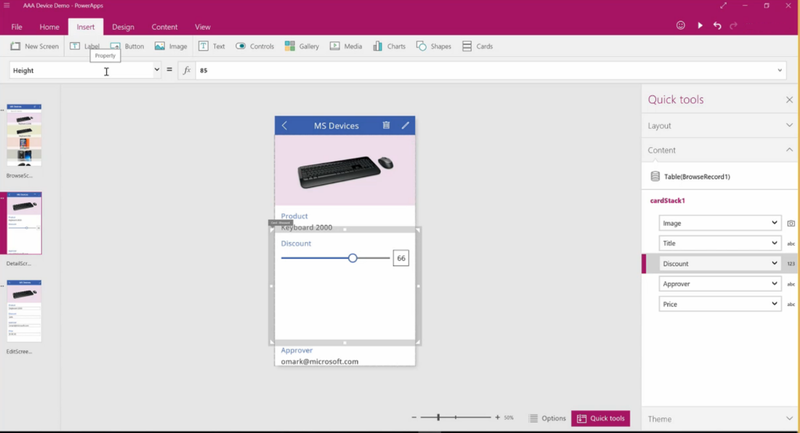 PowerApps can be developed by business users who have the ability to access corporate or third party data on mobile devices or through a web based interface. At launch, Microsoft is targeting PowerApps support for Windows, IOS, Android and Web browsers. A primary use case for the service is to allow business users to develop these applications by dragging and dropping controls and data sources onto a form-based user interface. Professional developers participate in the development of these applications by developing APIs on the Azure API App platform which can be consumed by PowerApps. IT Professionals manage the deployment of these applications and APIs in order to make applications available across the enterprise. The screen shot below illustrates the experience application authors will have when building their app by taking advantage out of box templates and data sources. Authors will also have the ability to target a device footprint including a phone or tablet. 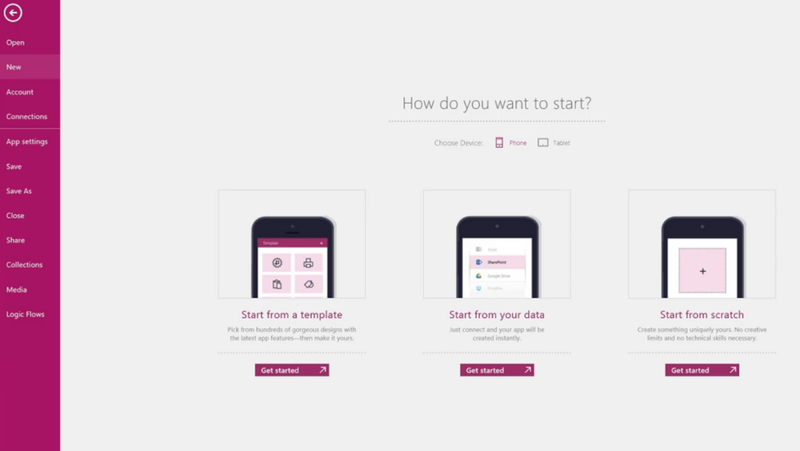 Once in the PowerApps designer, authors will have the ability to create forms and drag and drop different form controls onto the design canvas. Controls include labels, buttons, text boxes, media, charts and shapes. Behind these controls, events can be triggered such as interacting with a data source or third party system using Azure API Apps. The following image illustrates the design experience for application authors. In addition to calling out-of-box Azure API Apps, custom API apps can also be built and consumed via PowerApps. PowerApps are able to consume Azure API Apps much like Azure Logic Apps can. This connectivity is enabled through the use of Swagger metadata which creates an interface contract between the client and the API. 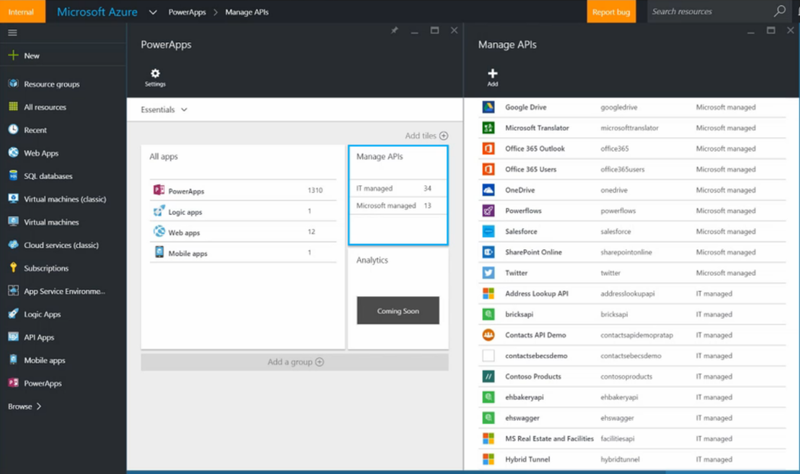 Azure API Apps can be written in a wide variety of languages including .NET, NodeJS, PHP, Python or Java. In addition to PowerApps calling APIs, they can also call lightweight workflows called Logic Flows. Logic Flows look and feel like Azure Logic Apps but do not have all of the advanced features such as the code behind editor. An example of where a customer may want to use a Logic Flow is an approval scenario. A Logic Flow will perform any required business logic and facilitate sending approval emails out to approvers. The following image illustrates what an approval workflow looks like in the Logic Flow designer. Much like Logic Apps and API Apps, PowerApps can be managed via the Microsoft Azure Portal where IT Pros can control what API Apps are available for consumption as illustrated in the following image. Administrators can also monitor the performance and health of the services that have been deployed and provision access to the applications via the Microsoft Azure Portal. User access is controlled through Azure Active Directory which allows organizations to manage users through existing internal processes. End users also have the ability to share applications through an email invite similar to how Office documents can be distributed. Pricing details are still to be determined, but it is expected that a free tier will be available for users who require access to a limited set of data sources. An enterprise tier is also expected which will provide access to enterprise data sources.